Sustainable, eco-friendly, fair trade, local, small business, recycled, up-cycled, vegan, cruelty-free, organic, zero-waste, the list goes on and on! Needless to say, it’s cool to be a conscious consumer nowadays, and I’ve made it easy to be for the holidays! Show your love for mother nature & the power of plants with an Eco-friendly EatMoveRest Recycled Cotton Market Tote! Whether you’re going to the farmers’ market, grocery store, coffee shop, or on vacation, this recycled cotton tote is perfect for carrying your goods in an eco-friendly, sustainable, zero-waste fashion! Unlike bulkier totes, this bag folds neatly and easily to fit into a small space. Snag All 3 Styles Below! Be sure to use discount code ‘TOTES’ at checkout for 10% off now through December 20th! Favorite Tees With A Message! Support the vegan movement and represent your healthy lifestyle with a tee by Vegetaryn! Everything from vegan leather boots to faux fur shirts, down alternative duds, wool-free wears, recycled water bottle bags, + fruit-pigmented makeup! Since Dusty and I are waiting to find out if Baby S will be a boy or a girl (due date Dec 22), we decided to go gender neutral with bright whites and beiges in the nursery—which suits our style anyways! I can’t wait to share my mama and newborn must-haves, as well as finished nursery photos in an upcoming blog post! My favorite vegan straw hats made by Ginger Parrish of GigiPip.com. Click each hat to check them out! Dusty’s top pick for our 2018 Conscious Consumer Gift Guide is his Wills vegan boots, and mine is my Matt & Nat vegan leather mini backpack! These Baxter Blue blue-light-blocking specs come in handy especially at night time, and help prevent hormone disruption and hiccups in our sleep cycles caused by the harmful blue-light emissions from our screens and devices. For FREE Express Shipping in the US & Canada, use discount code 'ERIN' at checkout! I have always been an avid cyclist, but especially since progressing into third trimester of my pregnancy, I have found stationary cycling to be the safest and most comfortable, low-impact cardio workout that keeps me feeling my best! Below is my favorite stationary bike trainer by CycleOps, and my favorite road cycling shoe brand, Pearl Izumi. My favorite handbag brand that I discovered this year is Samara. Not only are they a vegan company, they also use eco-friendly materials that are more safe for the environment than other vegan leather companies. They manufacture their products in a small factory where workers are treated well and pay the utmost attention to detail and quality! Use discount code ‘EATMOVEREST’ to receive 15% off your purchase! Another company that I have really come to appreciate is prAna. Not only are they fair trade certified, they also carry a line of organic cotton garments. Organic cotton drinks less water, uses rainwater more efficiently, eliminates GMOs and harmful chemicals from your closet, and switching just one t-shirt saves 115 gallons of water! Use discount code WCESF18 for 15% off your purchase! Check out some more of my Conscious Consumer Favorites on the EatMoveRest YouTube channel, and be sure to join the fam and Subscribe, turn on Notifications, give the video a Thumbs Up, leave some love in the Comments, and Share with family + friends! Ultimately, we all know that this is a season for giving, not just receiving! Two of my favorite charitable organizations are Love Justice (which fights one of the worst crimes—human-trafficking) and Charity Water (which helps to provide one of the most precious resources—clean drinking water). Feel free to read about them below, click, and donate to a worthy cause! Based right here in Lincoln, Nebraska, this organization is very near and dear to me and Dusty’s hearts. Through transit monitoring and interception, Love Justice, Intl. attacks trafficking at the most strategic moment—while it’s in the process of occurring and before exploitation and enslavement. They now have 44 stations located all across the globe, and have intercepted over 15,000 individuals from slavery, exploitation, and abuse. I love this organization because private donors cover all of their operation costs, so 100% of your donations go to providing clean drinking water to those in need. One in 10 people lack access to clean water and Charity Water is on a mission to change that. They’ve funded 29,725 water projects for 8.4 million people around the world. Save the Advent Reading Plan below to your camera roll, Share it with friends & fam, and pin it on Pinterest! From our (growing) family to yours, Dusty and I wish you all a Very Merry Christmas, Happy Holidays, and a Merry & Bright New Year! We can’t wait to continue sharing all-things EatMoveRest with you in 2019, and are beyond thrilled and excited for this new chapter in our lives! We appreciate your well wishes, prayers, love, and support, and look forward to bringing Baby S along with us on this adventure called life! Stay up-to-date with us on Instagram @ErinStanczyk & @DBStanczyk and be sure to subscribe to the monthly motivational In The Raw newsletter for exclusive EatMoveRest goodies! I'm sure we can all agree that temptations are running rampant around this time of the year between holiday parties and Grandma's baked goods. Treating yourself should be enjoyable, before, during, and after! Whenever I go to a holiday gathering, I don't show up empty-handed--instead, I use these festive times as an opportunity to take on a new challenge in the kitchen. I get the satisfaction of creating a new and delicious recipe, plus I don't have to worry about what to eat at the party! 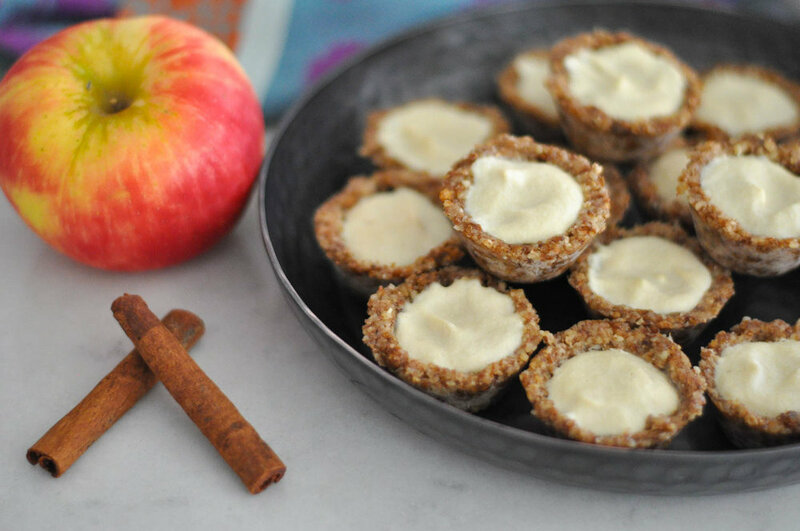 These Caramel Apple Cheesecake Bites are completely raw vegan, dairy-free, gluten-free, and they taste absolutely amazing! These bite-size delights are full of raw, whole-food goodness, and they make for the perfect holiday treat! Honeycrisp apples, cinnamon spice, and ooey-gooey caramel drizzle make for a festive combo, and cheesecake made with raw nuts makes for a healthy dairy alternative! Grind almonds in a food processor. Add mulberries and ground flax and continue grinding. Add water and pulse to incorporate. Dough should hold together when molded and shaped, if not, add more water. Press crust into mini cupcake or tart pans, and place into freezer while making creamy, apple cheesecake filling. Blend all ingredients in a high speed blender until smooth. Spoon the apple cream into each of the tart crusts, and place back in the freezer to chill while making the caramel apple topping. Whip all ingredients together except the apple to make caramel sauce. Fold in the apple until evenly coated and place on top of the cheesecake tarts to serve! To brighten up your cheesecake bites, try adding pomegranate arils to the top of each! EatMoveRest is all about finding balance between the three things we all do every day. To me, a comfortable and aesthetically pleasing home, or nest, is essential to overall well-being. There's nothing I love more than to get creative with the placement of special pieces throughout our home, especially around the holidays, and I very much consider the process not work, but Rest for my soul. We are Christmas elves, through and through! Dusty and I purchased our first home in the fall and moved in over Thanksgiving weekend, and immediately decked the halls for Christmas. We always feel that our humble abode is the most alive during the winter months, when we can embellish our surroundings with all of the decorations that made our house a home that very first year! This holiday season, I pray that you all take the time to do whatever it is that gives your soul Rest--whether that be creating something with your hands, crafting a new recipe, going on an outdoor adventure, or simply spending more downtime by the fireside with loved ones. 'Tis the season to practice self-love, self-care, and embody a spirit of Joy! I hope that all of you have a Very Merry Christmas and Happy Holidays.